Key Fire Protection, Inc. is a full service commercial, industrial, and residential automatic fire protection sprinkler company. We have been in business since June 10, 1977 and incorporated on April 1, 1989. Over the years, we have installed fire sprinkler systems ranging from very small residential projects to complex industrial applications. We are able to provide a full range of services, competitive pricing, and quality system installations that are in compliance with state and local standards. We are currently licensed in several states all over the nation and are continually expanding our market area. Our team consists of over 30 highly experienced and skilled construction personnel with well over 100 years combined experience. Key Fire Protection was founded by Jerry L. Key in 1977. As a kid, Jerry and his family survived by picking and chopping cotton in Eastern Arkansas. Because times where hard and income was a little bleak for his family, they grew their own garden and canned a lot of their own food. These early struggles in life, taught Jerry the value of hard work and discipline that is still the foundation of Key Fire Protection today. Jerry joined the National Guard his senior year in high school and served 6 months active duty in the army after graduation. After completing his tour of duty in the army, he took a temporary position working in a supermarket in Memphis, Tennessee. At that point, a friend told him about a job with a local fire protection company as a fire sprinkler apprentice making $2.47 an hour. Jerry got this job and worked his way thru the ranks to journeyman then foreman and ran jobs around the Mid-South. In 1971, the company asked him to move his wife and children to Jackson, Tennessee to open a construction office. By 1977 work in the area diminished and the office was closed. Rather than move, Jerry decided to invest his retirement of 15 years and hock the family house for $10,000 and a loan for a used truck. On June 10, 1977 he got a business license and started Key Fire Protection. Jerry’s customer relationships from years of great customer service continued with Key Fire Protection from almost the beginning. Many Companies like Jones Company in Humboldt , TN; Colonial Rubber in Dyersburg, TN, Dyersburg Fabrics in Dyersburg, TN; as well as H&M Construction in Jackson, TN; Ed Weaver Construction in Jackson, TN; Watlington Brothers, Inc. in Jackson, TN and many others helped Key Fire Protection survive the bad economical times of the 1970’s. Today Key Fire Protection continues to provide time-tested quality services. 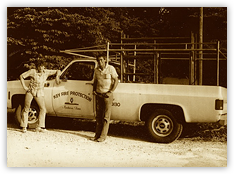 From our humble beginning in 1977, Jerry strived to provide professional, dependable, fire protection systems and service. 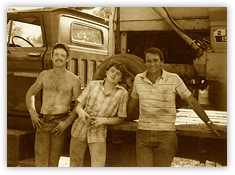 Today under second generation management, Jerry's three sons, Jerry Key Jr., Jimmy Key, and Jonathan Key continue the pursuit of excellence in the fire protection industry.